Wheat includes any agricultural cereal grass of the genus Triticum in the grass family Poaceae. Wheat is one of the top three cereal crops in terms of global production, along with maize and rice; together wheat, maize, and rice provide over half of the global requirement of calories and protein (Biodiversity International 2007). Wheat can grow in a wide range of climates; though, it grows most favorably in temperate climates and is susceptible to disease in very hot and humid zones. Reflecting human creativity, there are over fifty thousand cultivars of wheat currently in existence. Three important species of wheat are Triticum aestivum (common wheat), Triticum durum, and T. compactum; T. aestivum is used to make bread, T. durum is used to make pasta, and T. compactum is used to make softer cakes, crackers, cookies, and pastries. Wheat provides other values to human beings as well. It is used for fermentation to make biofuel, beer (Palmer 2001), and vodka (Neill 2002). Wheat is planted to a limited extent as a forage crop for livestock and the straw can be used as fodder for livestock or as a construction material for roofing thatch (A. Smith 1995). Wheat is a member of the grass family, Poaceae, one of the largest and most important plant families, which also includes rice and sugar cane. There are about 600 genera and perhaps ten thousand species of grasses. Grasses, like orchids and palms, are monocotyledons. Monocotyledons are one of two major groups of flowering plants (angiosperms), the other being dicotyledons. Monocotyledons have only one cotyledon, or embryo leaf, rather than the two found in Dicotyledons. The largest family in the monocotyledon group (and in the flowering plants) is the orchids. However, the most economically important family in this group is the grasses, which include the true grains (rice, wheat, maize, barley, etc.). Unlike dicotyledons, the true grasses are specialized for wind pollination and produce smaller flowers. Wheat is any of the cereal grasses of the Triticum genus. It has an inflorescence (group of cluster of flowers on a branch) that is a spike, an unbranched, indeterminate inflorescence with sessile flowers arranged along an axis. Each spikelet may have several florets with grains that may be hard or soft, white, red, or purple. The grain includes the embryo and a largely starch endosperm covered by layers. It is an annual plant. Most tetraploid wheats (e.g. emmer and durum wheat) are derived from wild emmer, T. dicoccoides. Wild emmer is the result of a hybridization between two diploid wild grasses, T. urartu and a wild goatgrass, such as Aegilops searsii or Ae. speltoides. The hybridization that formed wild emmer occurred in the wild, long before domestication. Hexaploid wheats evolved in farmers' fields. Either domesticated emmer or durum wheat hybridized with yet another wild diploid grass (Aegilops tauschii) to make the hexaploid wheats, spelt wheat, and bread wheat (Hancock 2004). There are many botanical classification systems used for wheat species. The name of a wheat species from one information source may not be the name of a wheat species in another. Within a species, wheat cultivars are further classified by wheat breeders and farmers in terms of growing season, such as winter wheat versus spring wheat, by gluten content, such as hard wheat (high protein content) versus soft wheat (high starch content), or by grain color (red, white, or amber) (Bridgwater 1966). Common wheat or Bread wheat—(T. aestivum). A hexaploid species that is the most widely cultivated in the world. Durum—(T. durum). The only tetraploid form of wheat widely used today, and the second most widely cultivated wheat. Einkorn—(T. monococcum). A diploid species with wild and cultivated variants. Domesticated at the same time as emmer wheat, but never reached the same importance. Emmer—(T. dicoccon). A tetraploid species, cultivated in ancient times but no longer in widespread use. Spelt—(T. spelta). Another hexaploid species cultivated in limited quantities. The four wild species of wheat, along with the domesticated varieties einkorn (Potts 1996), emmer (Nevo 2002), and spelt (Vaughan 2003) have hulls. 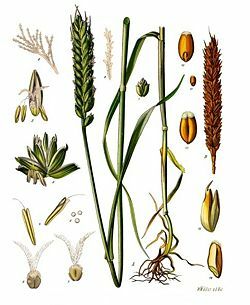 This more primitive morphology consists of toughened glumes that tightly enclose the grains, and, in domesticated wheats, a semi-brittle rachis that breaks easily on threshing. The result is that when threshed, the wheat ear breaks up into spikelets. To obtain the grain, further processing, such as milling or pounding, is needed to remove the hulls or husks. In contrast, in free-threshing (or naked) forms such as durum wheat and common wheat, the glumes are fragile and the rachis tough. On threshing, the chaff breaks up, releasing the grains. Hulled wheats are often stored as spikelets because the toughened glumes give good protection against pests of stored grain (Potts 1996). Wheat and barley were the first cereals known to have been domesticated. Wheat originated in Southwest Asia in the area known as the Fertile Crescent. The earliest archaeological evidence for wheat cultivation comes from the Levant (large area in Middle East) and Turkey. Around 10,000 years ago, wild einkorn and emmer wheat were domesticated as part of the origins of agriculture in the Fertile Crescent (Kingfisher 2004). Cultivation and repeated harvesting and sowing of the grains of wild grasses led to the domestication of wheat through selection of mutant forms with tough ears, which remained intact during harvesting, and larger grains. Because of the loss of seed dispersal mechanisms, domesticated wheats have limited capacity to propagate in the wild (C. Smith 1995). The cultivation of wheat began to spread beyond the Fertile Crescent during the Neolithic period. By about five thousand years ago, wheat had reached Ethiopia, India, Ireland, and Spain. A millennium later it reached China (C. Smith 1995). Agricultural cultivation using horse collar leveraged plows (three thousand years ago) increased cereal grain productivity yields, as did the use of seed drills which replaced broadcasting sowing of seed in the eighteenth century. Yields of wheat continued to increase, as new land came under cultivation and with improved agricultural husbandry involving the use of fertilizers, threshing machines and reaping machines (the 'combine harvester'), tractor-draw cultivators and planters, and better varieties. More currently, with population growth rates falling, while yields continue to rise, the acreage devoted to wheat may start to decline for the first time in modern human history (Economist 2005). In 2007, wheat stocks reached their lowest since 1981, and 2006 was the first year in which the world consumed more wheat than the world produced—a gap that is continuously widening as the requirement for wheat increases beyond production. The use of wheat as a bio-fuel will exacerbate the situation. In traditional agricultural systems, wheat is often grown as landraces, informal farmer-maintained populations that often maintain high levels of morophological diversity. Although landraces of wheat are no longer grown in Europe and North America, they continue to be important elsewhere. The origins of formal wheat breeding lie in the nineteenth century, when single-line varieties were created through selection of seed from a single plant noted to have desired properties. Modern wheat breeding developed in the first years of the twentieth century and was closely linked to the development of Mendelian genetics. The standard method of breeding inbred wheat cultivars is by crossing two lines using hand emasculation, then selfing or inbreeding the progeny many (ten or more) generations before release selections are identified to released as a variety or cultivar (Bajaj 1990). F1 hybrid wheat cultivars should not be confused with wheat cultivars deriving from standard plant breeding. Heterosis or hybrid vigor (as in the familiar F1 hybrids of maize) occurs in common (hexaploid) wheat, but it is difficult to produce seed of hybrid cultivars on a commercial scale as is done with maize, because wheat flowers are complete and normally self-pollinate (Bajaj 1990). Commercial hybrid wheat seed has been produced using chemical hybridizing agents, plant growth regulators that selectively interfere with pollen development, or naturally occurring cytoplasmic male sterility systems. Hybrid wheat has been a limited commercial success, in Europe (particularly France), the USA and South Africa (Basra 1999). Wheat normally requires between 110 and 130 days between planting and harvest, depending upon climate, seed type, and soil conditions. Crop management decisions require knowledge of the stage of development of the crop. In particular, spring fertilizer applications, herbicides, fungicides, and growth regulators are typically applied at specific stages of plant development. Knowledge of stages can be helpful in identifying periods of higher risk in a given climate. For example, during the meiosis stage, wheat is extremely susceptible to low temperatures (under four degrees Celsius) or high temperatures (over twenty-five degrees Celsius). Farmers also benefit from knowing when the flag leaf (last leaf) appears, as this leaf accounts for about seventy-five percent of photosynthesis reactions during the grain-filling period, and as a result should be preserved from disease or insect attacks to ensure a good yield. Several systems exist to identify crop stages, with the Feekes and Zadoks scales being the most widely used. Each scale is a standard system that describes successive stages reached by the crop during the agricultural season. Estimates of the amount of wheat production lost owing to plant diseases vary between ten and twenty-five percent in Missouri (Palm 1993). A wide range of organisms infect wheat, of which the most important are viruses and fungi. Some common viruses include barley yellow dwarf virus (BYDV), wheat streak mosaic (WSM), and wheat soil-borne mosaic (WSBM). Wheat is used as a food plant by the larvae of some Lepidoptera species including The Flame, Rustic Shoulder-knot, Setaceous Hebrew Character, and Turnip Moth. China, India, the United States, and Russia are top wheat producing countries. Wheat production is globally more widespread than rice, though China's share is almost one-sixth of the world production. Durum—Very hard, translucent, light colored grain used to make semolina flour for pasta. Hard Red Spring—Hard, brownish, high-protein wheat used for bread and hard baked goods. Bread flour and high gluten flours are commonly made from hard red spring wheat. It is primarily traded at the Minneapolis Grain Exchange. Hard Red Winter—Hard, brownish, mellow high-protein wheat used for bread, hard baked goods, and as an adjunct in other flours to increase protein in pastry flour for pie crusts. Some brands of unbleached, all-purpose flour are commonly made from hard red winter wheat alone. It is primarily traded by the Kansas City Board of Trade. Soft Red Winter—Soft, low-protein wheat used for cakes, pie crusts, biscuits, and muffins. Cake flour, pastry flour, and some self-rising flours with baking powder and salt added are made from soft red winter wheat. It is primarily traded by the Chicago Board of Trade. Hard White—Hard, light colored, opaque, chalky, medium-protein wheat planted in dry, temperate areas. It is used for bread and brewing. Soft White—Soft, light-colored, very low-protein wheat grown in temperate, moist areas. It is used for pie crusts and pastry. Pastry flour, for example, is sometimes made from soft white winter wheat. Hard wheats are harder to process and red wheats sometimes need bleaching. Therefore, soft and white wheats usually command higher prices than hard and red wheats on the commodities market. Harvested wheat grain that enters trade is classified according to grain properties for the purposes of the commodities market. Wheat buyers use the classifications to help determine which wheat to purchase as each class has special uses. Wheat producers determine which classes of wheat are the most profitable to cultivate with this system. Wheat is widely cultivated as a cash crop because it produces a good yield per unit area, grows well in a temperate climate even with a moderately short growing season, and yields a versatile, high-quality flour that is widely used in baking. Most breads are made with wheat flour, including many breads named for the other grains they contain like most rye and oat breads. Many other popular foods are made from wheat flour as well, resulting in a large demand for the grain even in economies with a significant food surplus. Raw wheat seeds are a food ingredient called whole wheat. They can be powdered into flour, germinated and dried creating malt, crushed and de-branned into cracked wheat, parboiled (or steamed), dried, crushed and de-branned into bulgur, or processed into semolina, pasta, or roux. They are a major ingredient in such foods as bread, breakfast cereals (examples include Wheatena, Cream of Wheat), roti (Indian bread), naan, porridge, crackers, biscuits, pancakes, cakes, and gravy. One hundred grams of hard red winter wheat contains about 12.6 grams of protein, 1.5 grams of total fat, 71 grams of carbohydrate (by difference), 12.2 grams of dietary fiber, and 3.2 mg of iron or 17 percent of the amount required daily. One hundred grams of hard red spring wheat contains about 15.4 grams of protein, 1.9 grams of total fat, 68 grams of carbohydrate (by difference), 12.2 grams of dietary fiber, and 3.6 mg of iron or 20 percent of the amount required daily (USDA ARS 2006). Gluten protein found in wheat (and other Triticeae) is hard to digest, and intolerable for people with celiac disease (an autoimmune disorder in roughly one percent of Indo-European populations). Antonio, S. 1996. I Semi Della Civiltà. Grano, Riso e Mais Nella Storia Delle Società Umane. Prefazione di Luigi Bernabò Brea, Avenue Media, Bologna. ISBN 8886817029. Basra, A. S. 1999. Heterosis and Hybrid Seed Production in Agronomic Crops. Haworth Press. ISBN 1560228768. Bajaj, Y. P. S. 1990. Wheat. Springer. ISBN 3540518096. Biodiversity International. 2007. Cereals Biodiversity International. Retrieved August 1, 2007. Bridgwater, W., and B. Aldrich. 1966. The Columbia-Viking Desk Encyclopedia. Columbia University. 1959. ISBN 9780670230747. Bonjean, A. P., and W. J. Angus (eds.). 2001. The World Wheat Book: A History of Wheat Breeding. Paris: Lavoisier Publ.. ISBN 2743004029. Economist. 2005. Ears of plenty: The story of wheat The Economist. Retrieved January 8, 2006. Food and Agriculture Organization (FAO). 2005. FAOSTAT United Nations Food and Agriculture Organization. Retrieved May 15, 2006. Garnsey, P. 1983. Trade in the Ancient Economy. London: Chatto & Windus. ISBN 0520048032. Kingfisher Books. 2004. The Kingfisher History Encyclopedia. Kingfisher Publications. ISBN 0753457849. Hancock, J. F. 2004. Plant Evolution and the Origin of Crop Species. CABI Publishing. ISBN 085199685X. Heiser, C. B. 1990. Seed to Civilization. The Story of Food. Harvard University Press. ISBN 0674796810. Harlan, J. R. 1975. Crops and Man. Madison, WI: American Society of Agronomy. ISBN 0891181075. Naum, J. 1950. The daily bread of ancient Greeks and Romans. Osiris 9: 227-253. Naum, J. 1944. The Wheats of Classical Antiquity. Baltimore: Johns Hopkins Press. Neill, R. 2002. Booze: The Drinks Bible for the 21st Century. Octopus Publishing Group-Cassell Illustrated. ISBN 1841881961. Nevo, E., A. B. Korol, A. Beiles, and T. Fahima. 2002. Evolution of Wild Emmer and Wheat Improvement: Population Genetics, Genetic Resources, and Genome.... Springer. ISBN 3540417508. Palm, E. W. 1993. Wheat diseases in Missouri University of Missouri. Retrieved May 15, 2007. Palmer, J. J. 2001. How to Brew. Defenestrative Pub Co. ISBN 0971057907. Potts, D. T. 1996. Mesopotamia Civilization: The Material Foundations. Cornell University Press. ISBN 0801433398. Sauer, J. D. 1993.Geography of Crop Plants. A Select Roster. Boca Raton: CRC Press. ISBN 9780849389016. Smith, A. E. 1995. Handbook of Weed Management Systems. Marcel Dekker. ISBN 0824795474. Smith, C. W. 1995. Crop Production. John Wiley and Sons. ISBN 0471079723. USDA ARS. 2006. USDA national nutrient database for standard reference United States Department of Agriculture. Retrieved May 15, 2005. Vaughan, J. G., and P. A. Judd. 2003. The Oxford Book of Health Foods. Oxford University Press. ISBN 0198504594. This page was last modified on 19 October 2016, at 17:22.